With Costco on one side and Rock Creek dominating the other, Superior feels like two separate entities. This is all about to change with the new Superior Town Center development. This major undertaking will unite the community and add 1,400 residences in the process. And ground is breaking – finally – with the long anticipated, $36 million dollar Boulder Valley Ice Arena at the Southeast corner of Hwy 36 and McCaslin Blvd (updated 1/27/15). 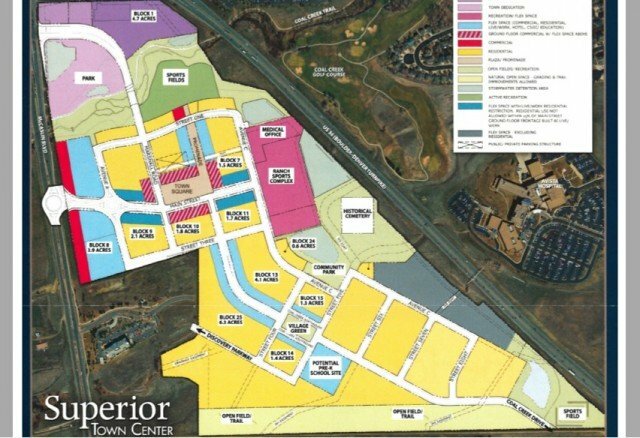 Superior Town Center is set to become the commercial and retail hub of Superior. A half million square feet of commercial and retail, centered on an open plaza or square. Another 300,000 plus square feet of office space with ten restaurants and one incredible sports complex within walking distance on day one. Up to 500 hotel rooms plus conference meeting space. All easily accessible off Hwy 36 thanks to a new, state of the art diverging diamond interchange. Superior Town Center will be a destination hot spot. The project is being developed by Ranch Capital, LLC. This group has a grand vision and will sub out the individual communities it conceptualizes. I asked for an example — what we can expect. R. Randy Goodson (the fellow heading up this project) suggested I check out San Elijo Hills, California. Here is a map of that community and overview here. Peter Calthorpe brings three important principals to the Super Town Center design. Human Scale, Conservationism and diversity. Human scale is the concept of designing the space around people and walking, not cars. Diversity will share the space across a wide number of uses and age groups. Superior Town Center is imagined as a central plaza with shopping, dining and work within in walking distance. Parking will be hidden and close at hand with garages instead of endless surface lots. Open Space and the mountains are an important aspect of Boulder Colorado. Expect to see this built into the area, and a respect, even love for the area upheld. What sets this project apart though? A one of kind indoor sports facility. Accentuating Superior Town Center will an incredible indoor sports complex. Not an arena for viewing, but a incomparable complex for citizens. Two NHL sized ice sheets. A full major league sized soccer field (cross-striped to allow three games at once). Basketball courts. Oh, and did I mention two swimming pools? All indoors, all waiting for you at Superior Town Center. Photos To Be Attached shortly. Please check back. I am interested in the residences. When will information be available?